In Redeeming Sociology we learn that interpersonal relationships are possible for humans because we are created in the image of a Trinitarian God. But if the Trinity is our model for relationships, why is the human condition rife with pain and evil? How are we to think correctly about fallen human relationships and our models for understanding them? 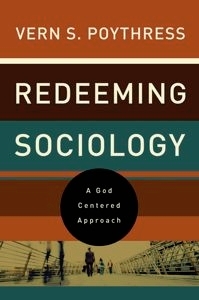 Redeeming Sociology advocates a biblically informed model for human relationships—relationships rooted in the Trinitarian character of God, his governance of the world, and his redemption accomplished in Christ. Poythress examines how the breaking of relationships through sin leads to strife, murder, and oppression among human beings and sets cultures against one another. And he shows how these broken relationships are restored through the outworking of redemption in Christ. Though typical sociological models for interpersonal relationships may offer some valuable insights, they are handicapped by a fundamental misunderstanding of humanity. The biblical model that Poythress presents correctly diagnoses the problem of human relationships, so it can likewise prescribe a biblical solution that infuses new meaning and power into how we relate to others made in the image of God. About the Author: Vern Poythress is professor of New Testament interpretation at Westminster Theological Seminary. He has six earned degrees, including a PhD from Harvard University and a ThD from the University of Stellenbosch. He is the author of ten books, including Redeeming Science and In the Beginning Was the Word.